If you fancy jazzing up your week and waking up your taste buds, then a trip to The Real Greek is on the cards. This is hands down the place to go for one fine culinary adventure - taking you straight to Santorini and giving you an authentic taste of Athens - The Real Greek is the real deal. The vibrant and inviting restaurants make idyllic destinations for families and groups of friends. The Real Greek will let you basque in not only Eastern Mediterranean speciality dishes, but also in the wonderful culture of sharing food and making a proper meal of every dining experience. Serving up those old time favourites, and while healthy hummus and the freshest of pitta bread adorn the menu, you’ll be able to try and taste a variety of meze platters with contemporary twists. From succulent chicken souvlaki to tangy salads and dips, tender vegetable dishes and more, when there’s a traditional Greek plate to suit all tastes, everyone can get their Greek on at The Real Greek. How do I use my The Real Greek voucher? Choose the voucher you'd like to use and click the 'shop now' link to book your table. Be sure to select The Real Greek offer you'd like to use and continue to complete your reservation. Be sure to opt-in for emails from The Real Greek so that you stay up to date with the latest and tastiest offers. Does The Real Greek offer student discount? Students are in for a Real Greek treat when a valid NUS card will get you 25% off the food bill. When does the The Real Greek restaurant open? As you book a table at your the nearest Real Greek restaurant, you’ll be able to see the opening hours. Does The Real Greek have a vegan menu? There’s a variety of vegan options available from The Real Greek, which is marked up on the menu alongside gluten-free and vegetarian options. Does The Real Greek deliver? You will be You can have all The Real Greek goodness delivered to your door with Deliveroo. You will be sent an email containing your booking confirmation number once you’ve finalised a table at The Real Greek. 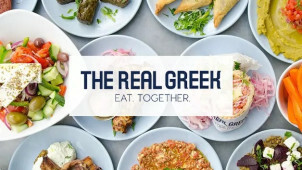 You can cancel your booking at The Real Greek via bookatable.com using your email address and booking reference. Message The Real Greek online or call your local restaurant. For an authentic taste of Greece, and for a proper introduction to the flavours of the med, The Real Greek is the restaurant for you. No other establishment will satisfy your craving for a fresh and delicious meal quite like it, and when The Real Greek voucher will let you save on your souvlaki without making a ‘meze’ of your finances (sorry), you’ll be able to conquer your hunger like a champion. You can really get your Opa on in a select few of The Real Greek restaurants around the UK! From Bristol to Windsor and London Soho, you’ll be able to enjoy a little Athens by night with all the live music and Greek party vibes to enjoy as you dive in to a banquet of authentic food! Check out what’s on near you and you won’t actually need to fork out on a flight to Greece when you take take a short trip to The Real Greek. From The Real Greek in Dulwich to Covent Garden, experiencing authentic Greek cuisine in one of the London restaurants is a great way to branch out in the big smoke. Whether you’re simply passing through or a full-time Londoner, The Real Greek discount will let you enjoy more of a seriously tasty menu for less. Get ready for brilliant hospitality in each hearty establishment - The Real Greek London restaurants are hotspots in themselves!